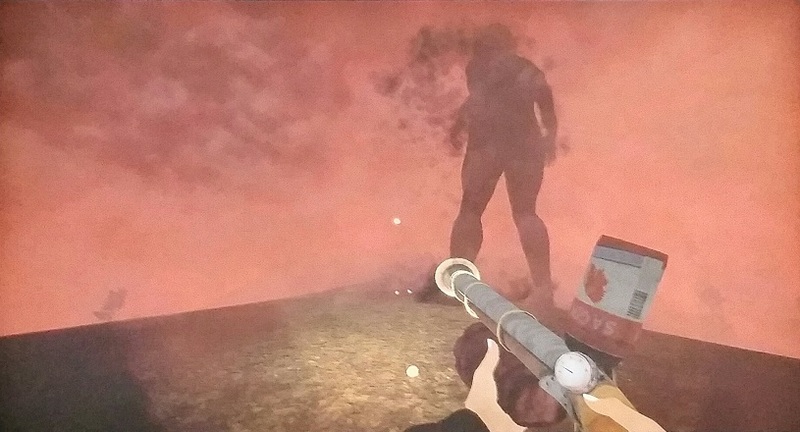 Sylvio is a first-person “supernatural horror” video game from indie-developer Stroboskop. The game was released on Steam in June 2015. A remastered version followed in 2016, and the game was later released on consoles on Friday, January 13th, 2017. Sylvio was also nominated for the Best Original Game award at the 2015 TIGA Awards. In Sylvio, you assume the role of a young ghost recorder named Juliette Waters. Presumably for kicks, Juliette decides late one evening to sneak her way into Saginaw Park, a family nature and amusement park that was abandoned after a bizarre landslide killed multiple guests and employees in 1971. With the use of her trusty reel-to-reel recorder, Juliette hopes to capture the voices of those tragically killed in the landslide all those years prior and to unravel any mystery surrounding those events. Juliette’s hopes are indeed fulfilled, but what she also uncovers is a tale of an ancient curse and a wicked family cult, one that may still be living within the walls of the long-closed park. After a brief introduction scene that exists only to help establish mood, as well as to recognize what I assume to be one of the game’s more “financially invested” Kickstarter campaign backers, you begin your adventure by breaking into the long deserted Saginaw Park. This involves ripping a “No Trespassing” sign from the ground and scaling the park’s perimeter wall. Once inside, you find… well, not much. Other than a sign featuring the park’s frog mascot, the entrance to the park is quite barren. The key gameplay element comes through the use of your recorder’s microphone. Besides occasionally picking up whispers and other ghostly echoes, the microphone also features a meter that can detect nearby spiritual forces, whether they be peaceful of malevolent, as well as tell how far away from you they are. 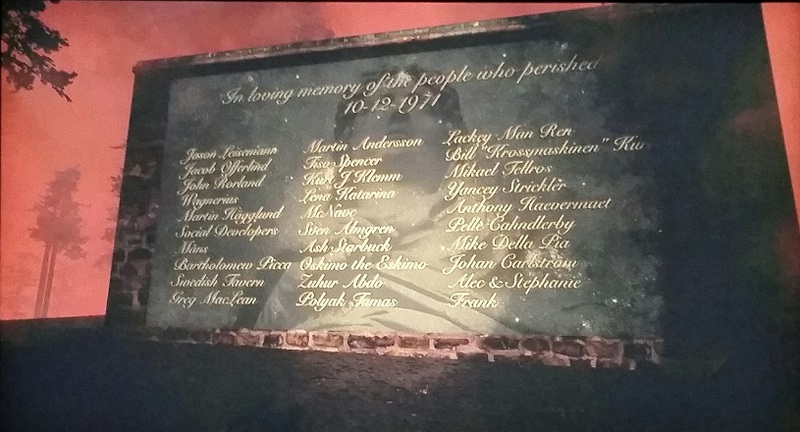 Using these whispers, as well as other reels that you’ll find scattered throughout the park, you attempt to piece together the mystery surrounding that fateful day in 1971. You begin to walk up the side of a steep hill formed by the landslide, but soon the ground gives way beneath you. You drop a short distance and find yourself in what was once the park’s barroom, the broken glass roof above you. Stuck below, you make your way from room to room in search of keys, clickers, and other items which will be needed to grant access to other rooms and areas. Your objective seemingly unclear, you then progress your way down into the lower levels of the bar. You’ll soon find a garage area with a solitary car waiting for you to drive off in. However, as should probably be assumed, the car needs parts in order to start. This is also where you will encounter your first “enemy”. During your adventure, you will frequently encounter evil spirits. These are either represented as an amorphous black cloud that slowly chases you as it swims through the air, or large “silhouettes” of darkness. These spirits can be vanquished by shooting them with a pressurized cannon that fires objects such as nails, rocks, and balls. The nails and other metal “projectiles” damage the spirits, while the rocks and balls are primarily for knocking over items in some of the game’s many puzzles. Unfortunately, this is also where I first discovered a “bug” where the orbs disappear from sight altogether, but still inflict damage to your character. Damage is received if these entities get too close to you, but as there is no health bar, this is represented by the screen becoming blurred and tinted as they draw too near. If killed, you will restart from the last checkpoint, but as there is no “Game Over” screen, you might not even know that you’ve died the first time it happens. Sylvio does feature an auto-save system, and I didn’t have to repeat many previously completed challenges when I did “die”. Vanquishing these lingering spirits temporarily unleashes a barrage of “voices” which can be recorded with your recorder’s microphone, which serve as hints towards the backstory. Occasionally, you can have a “seance” with a lingering spirit who will provide you with longer messages. These “messages” can then be replayed on your reel-to-reel. Playing the recordings forwards and backwards at various speeds reveals more “messages” hidden within the recording. These “messages” will then appear on-screen to mark the location of other scattered items and clues. After finding the parts needed to repair the car, you make your way back above ground. From here, you’ll search the vast outdoors of the park for more “voices” and other clues. The game doesn’t offer much in the line of guidance, leaving the player to freely wander around until they find a point of interest, of which there aren’t all that many. While this does make Sylvio feel a little less linear than it actually is, it also makes the game feel highly unfocused. The story doesn’t progress along as smoothly as it presumably would with clearer objectives. While there are numerous trees, rocks, and small buildings scattered throughout the park’s outdoor areas, the most dominant feature is a foggy, rust-tinted sky. 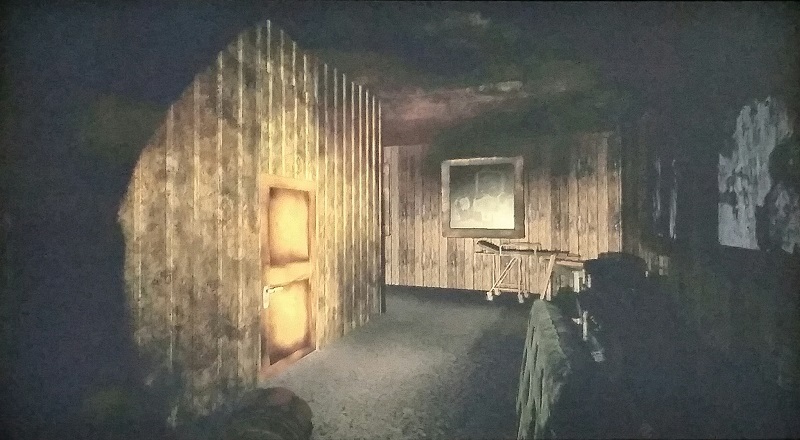 While this approach does play into the game’s story and does help establish an eerie atmosphere, I couldn’t help but feel that this was implemented as much for it’s ability to help create “atmosphere” as it was for its use in obscuring the “drawing in” of the graphics of distant objects as the player progressed towards them. This was an effect heavily used on most Nintendo 64 games, helping that system earn the not-so-affectionate nickname of “The Fog Machine”. 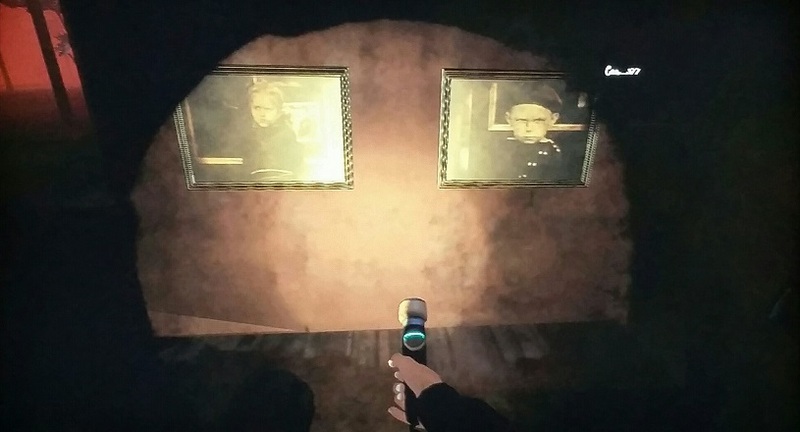 The aforementioned fog, as well as pictures and paintings of small children that you’ll later find adoring the walls of various buildings, helps establish the “creep factor” that is found permeating throughout Sylvio. While the game is indeed quite eerie, it’s not particularly “scary”. While “jump scares” are usually seen as a cheap and easy tactic in movies, they definitely help propel the fright factor in a video game. Sadly, there are none to be found here. 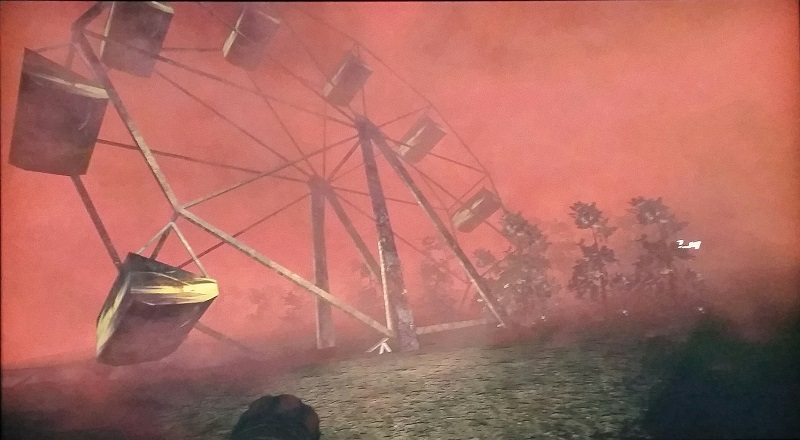 Honestly, other than the story itself, there really isn’t much to be found in Sylvio that drives home the scares. Thus, the game quickly becomes repetitious and, dare I say, boring. A few later “levels”, if you can really call them that, have you driving to one or two different spots on a vast map for a quick “chat” with a spirit, and then “warping” to another area after an abrupt loading scene. You are free to walk instead of using the car, which allows you to record any “voices” found along the way, but walking is significantly slower than driving. However, due to the general spareness of the landscapes, there is nothing really worth seeing. The graphics are decent enough, but noticeably below average modern gaming standards. Then again, how great do graphics need to be when there’s admittedly not much on display. The audio quality more than makes up for any shortcomings in the graphics department, but as the selling point of this game is in the “ghost recordings”, it had damn well better be “on point”. Ghost “whispers” can initially be a little unsettling and help quickly set the desired “mood”, but the novelty quickly wears off. And just like most alleged ghost recordings, the “words” spoken tend to be so unclear that you aren’t really sure just what was said until the game “tells you” what you’ve heard. More unsettling are the almost bestial howls that can be heard carrying in the wind from a distance. Sadly, the source of these guttural sounds is never truly revealed. The sparse landscapes, the repetitive objectives, and a few pointless puzzles almost make Sylvio feel like an unfinished game. I even found one particular glitch that allowed me to sideways walk through a wall. To add to the frustration, some of the puzzles are just asinine. Your character should rightfully not be able to walk across power lines or roller coaster rails. You shouldn’t be able to fall from the top of tall rides and buildings and not take a scratch. To make matters even worse, there is nothing to indicate that not only are you capable of performing these feats of athleticism and superhuman behavior, but in more than a few cases, you will be forced to do so in order to progress. Sylvio can be completed in about 10-15 hours, depending on how much exploring you choose to do. Even at that length, it still feels like it was stretched out just a little too long. The game finally delivers what I considered to be a massively disappointing ending. Let me say that the ending totally fits the story, but just like most of Sylvio‘s cutscenes, feels drastically abrupt and will leave more than a few gamers vastly underwhelmed and possibly a little pissed. There’s a really clever storyline to be found here, but unfortunately, the developer decided to bury most of it in tape reels that you really don’t have much reason to listen to other than to expand the backstory. Even then, by the time the story is fully revealed, quite a few gamers will have presumably already moved on to more entertaining games. Sylvio promises a thrilling game experience built on subtle horror. What it delivers is missed opportunities and waves upon waves of rusty fog. At $13, Sylvio won’t break the bank, but as it occasionally feels like a tech demo for an older gaming system, it also won’t feel worth even that lowered price. While Sylvio has received multiple rave reviews from critics, most cheering the game’s story, gamers that played Sylvio must have felt something closer to my own opinions as a Kickstarter for a sequel came well short of being funded this past December.